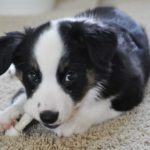 Chewing when your puppy is teething is normal. But if that habit continues after eight months or if your dog starts gnawing on you, your furniture or other belongings, take action. Rehabilitate your anxious chewer: Use exercise, toys, treats, and training to stop inappropriate behavior. 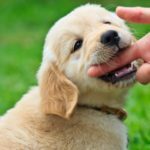 Stop puppy biting: Use four simple tips to eliminate puppy biting: discipline, distraction, firm commands, and no rough play. 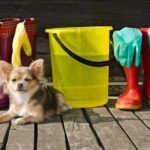 Raise a polite pooch: Don’t allow jumping, begging or mouthiness. 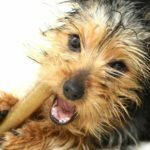 Tips and tricks: Use bitter apple or dog-safe chew toys. 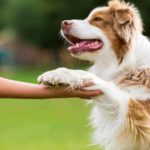 Use patience, education and positive reinforcement to make sure your pup has good dog manners. Don’t allow jumping, begging or mouthiness. Rehabilitate your anxious chewer with exercise, toys, treats, training. If your dog is eight months old and still chewing, it’s not teething.